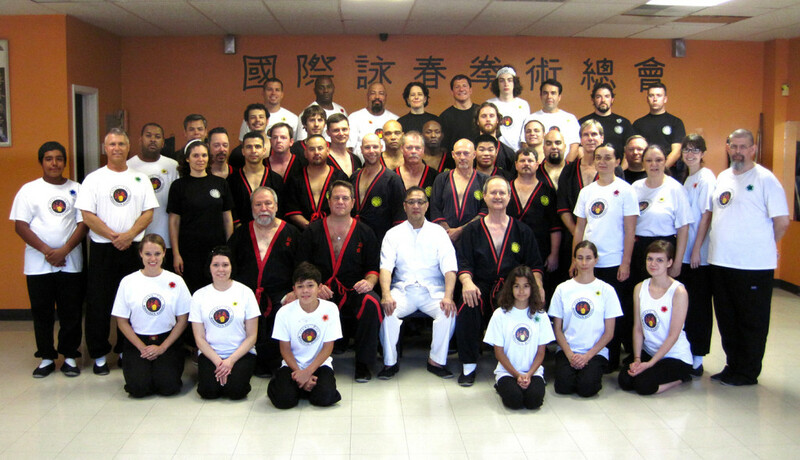 Pictured are the seminar participants at the Oct 25 and 26, 2014 seminar with Great Grandmaster Leung Ting in San Antonio, TX. The seminar host was Master William Parker of the San Antonio WingTsun Academy. There was an additional module on Friday Oct. 24 for Technician Level participants. Students and instructors came from many parts of the U.S. to learn from the founder of the Leung Ting WingTsun® system, Grandmaster Leung Ting. 2018 North American WingTsun Seminars with Great Grandmaster Leung Ting – Save the Dates! All text, photos, graphics and logos are property of the IWTA-NAS, LLC. All Rights Reserved. The phrase Leung Ting WingTsun® and the IWTA-NAS and IWTA circular logos are registered trademarks of Great Grandmaster Professor Leung Ting with the United States Patent and Trademark Office and are used herein with permission. WingTsun™ and Wing Tsun™ are trademarks of Great Grandmaster Professor Leung Ting and the IWTA and are used herein with permission. No part of this website is to be used elsewhere without the express written permission of the IWTA-NAS, L.L.C.